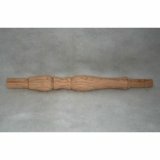 We currently offer Red Oak Arm Posts. Special Order - Please allow 1 week for shipment. Full size pictures are available on each product page, just click to zoom in.